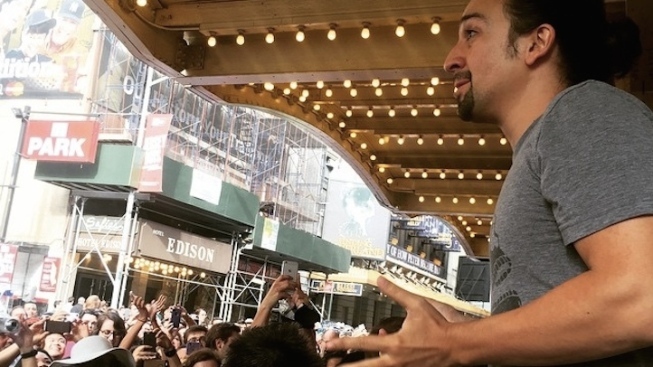 Lin-Manuel Miranda addresses the crowd at the first "Hamilton" lottery. The $10 ticket lottery to Lin-Manuel Miranda’s “Hamilton,” which attracted over 700 people on its first day, will return from its digital hiatus to the Richard Rodgers Theatre — but for Wednesday matinees only. The Wednesday lottos, which begin April 6 and have been nicknamed “Ham4Ham” by fans, will include live performances from Miranda and special guests. Entries will be accepted beginning at 12 pm, with the drawing occurring a half hour later. The digital $10 “Hamiton” lottery will remain in place for all other performances. The digital lotto began as a temporary solution during the cold winter months, but has become immensely popular since launch. You can enter the digital lottery here. Only 21 front-row tickets are made available for each lottery. Regulating the in-person lottery to once a week during working hours might also solve the problem of controlling the crowds of hopefuls — often in the hundreds — from blocking the street on 46th Street between Broadway and Eighth Avenue. “We need to figure out how to safely accommodate our fans without blocking traffic,” producer Jeffrey Seller said in a statement. Last month, “Hamilton” producers made another step in crowd-control, limiting its standby line to just 30 people.